For information on Earth Day at Ojibway visit http://www.mnsi.net/~ewswarl/. Wednesday, March 27: Winter has returned with 10 cm of snow on the ground from the past two days. Hungry robins have stripped the berries off highbush cranberry shrubs, food that was ignored all winter by other birds in the park. Saturday, March 16: Ojibway's "Wild for Waterfowl" field trip on Saturday visited Wheatley Harbour, Hillman Marsh and the north end of Point Pelee National Park. Waterfowl were very co-operative with 20 species for the day (Canada Goose, Wood Duck, Green-winged Teal, American Black Duck, Mallard, Northern Pintail, Blue-winged Teal, Northern Shoveler, Gadwall, American Wigeon, Canvasback, Redhead, Ring-necked Duck, Greater Scaup, Lesser Scaup, Common Goldeneye, Bufflehead, Common Merganser, Red-breasted Merganser, Ruddy Duck). New spring arrivals included Double-crested Cormorant, Horned Grebe, Great Blue Heron, American Coot, Lesser Yellowlegs and Eastern Meadowlark. We also had great looks at three Little Gulls, a dark phase Rough-legged Hawk, adult Merlin, adult Bald Eagle and several Northern Harriers. Friday, March 15: Spring continues to advance at Ojibway. Chorus Frogs have been loudly calling at Tallgrass Prairie Heritage Park since yesterday and today there was a Midland Painted Turtle basking along the creek. The first migrant Turkey Vulture and Purple Finches were seen yesterday, Rusty Blackbirds today and Mourning Cloak butterflies today and yesterday. American Robins are now conspicuous throughout the area. 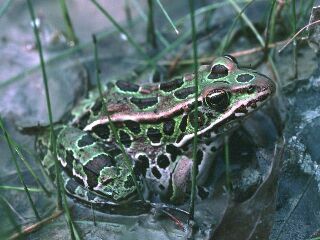 Wednesday, March 13: The first few Chorus Frogs were heard calling at Spring Garden Prairie on March 8 by Fred Urie. Last night there was a loud "chorus" of these tiny frogs reported at Marshfield Woods near Harrow by Lynn Meloche. Tuesday, March 12: Windsor's first Yellow-bellied Sapsucker of the spring was found today by Betty Leamouth. Saturday, March 9: American Robins arrived overnight and several were heard singing this morning in LaSalle before the cold front arrived. A Killdeer and American Woodcock were heard calling last night at East Riverside Park by Dave D'Hondt. Monday, March 4: American Woodcock should be arriving later this week as temperatures rise above freezing. They can easily be heard (and sometimes seen) along the Titcombe bikeway which separates the Ojibway Prairie Provincial Nature Reserve and Tallgrass Prairie Heritage Park. The males begin their flight displays at twilight when it is still possible to pick out a silhouette against the fading light. Pick an evening when the wind is calm and temperatures are not too cold. Now is the time to clean out and install bluebird boxes and watch for the first waves of robins to return.